Most of us have our pensions invested in passive funds. I use a passive grammatical structure because we do not choose , our funds are chosen by others, hopefully with our best interests in mind. So the best we – as individual investors can do – is trust that those who look after us- trustees and Investment Governance Committees (IGCs) know what they are doing and are working hard for us. This piece of work is about helping ordinary people (pension investors) ask questions of trustees and IGCs and for trustees and IGCs to think about when looking at the investment funds they are employing to provide us with the best outcomes when we retire. Necessarily I am talking about passive funds as almost all the money in the DC defaults is passively managed. We think when we invest in a passive fund that tracks an index, that it will give us the return on the index, less a stated charge which is what we pay for the fund. There are three issues with this. Firstly (if we are in a GPP or mastertrust default), we don’t know what the provider is paying for the fund. Bear with me as I try to explain, this is important and you can’t google it. You won’t get told this in your product literature and most people who you talk to at the pension provider won’t know much about this. Infact it is all so obscure that you will have to pay an investment consultant a large amount of money to explain what is going on , and since most investment consultants have their eyes on other balls (DB solvency typically), you’ll have to get lucky with the investment consultant as well! This is why Andy Haldane, Chief Economist of the Bank of England is right when he says he doesn’t understand his pension fund. It’s bloody hard, this article is very long and though I’ll try to make it fun as we go along, I don’t blame anyone on giving up. If you do, you might like to skip to the very end where I sum things up. 1. What is being paid for the fund (and by whom). What you pay for your pension is not what your pension provider pays for your pension fund. The cost of your pension fund to the pension provider is subject to an Investment Management Agreement (IMAs) and is secret. It should not be secret, but it invariably is, because of implicit (contractual) or explicit non disclosure agreements. Even the trustees of the schemes and the Independent Governance Committees don’t tell you about the details of the IMAs. But having worked for insurance companies, I know that the cost the pension provider pays for a fund can be less than 10% of the annual management charge you pay. I hear rumours of IMAs where the cost of the default fund is less than 0.05% while the AMC to the investor is more than 0.50% – ten times more than the fund cost. The rest of what you pay is for the additional services offered by the provider. Not only does the IMA detail what the pension provider is paying, but it agrees what the beneficiary of the fund is getting by way of services. With an index tracker , you might expect that the member is getting the exact return of the index but that may not be the case. Generally, the master trust providers and insurance companies drive a hard bargain on the cost of the funds they buy for you. But that bargain may benefit them more than it benefits you, infact the more they screw the asset manager, the more the manager may be screwing you. That’s why Trustees and IGCs are absolutely vital, they are there to make sure the IMAs are fair to all. Is an IMA good or bad? A trustee or IGC can only work this out when they understand the total consequence for the member of the Investment Management Agreement. If the IMA offers a very low price to the provider and delivers low fund expenses and full enhancements (see below) then it is a good IMA. But if the IMA offers low cost to the provider in return for which the member carries all the fund expenses and gets a poor deal on enhancements, then the IMA is bad. If the IMA doesn’t promise standards for tracking error and tracking difference – then the performance of the fund cannot be measured and the IMA is incomplete (and bad). It is vital that Trustees and IGCs have access to the IMA itself and that they know what it is saying. They should get professional help to understand the IMA. The trustees/IGCs ought to know what they are choosing for their members and should be clear about what tracking error and tracking difference they should be expecting from the funds. In my experience, most trustees and some IGCs are not asking these questions. Some have never looked at the IMAs and some have never even asked to see them. Once the provider, trustee/IGC and fund manager are happy with the IMA, a process needs to be in place to make sure that the IMA is being kept to. In answer to the question, the IMA is good or bad firstly for what it promises and secondly for how well those promises are kept. Tracking error is often cited as a key factor in passive fund selection. Tracking error is to tracker funds as goal tally is to a Premiership striker – a fundamental measure of how well the job is being done. A tracker’s role is to deliver the returns of its benchmark index. In an ideal world, if the FTSE All-Share index returns 10% a year, then a FTSE All-Share tracker will also return 10%. But the world is rarely perfect (mine isn’t anyway), and tracking error shows just how wide of the (bench) mark the performance is. What exactly is tracking error? Like so many investing terms, there are many different versions of tracking error and ways of calculating it. It’s therefore often difficult to be sure that two different sources are talking about the same measure. 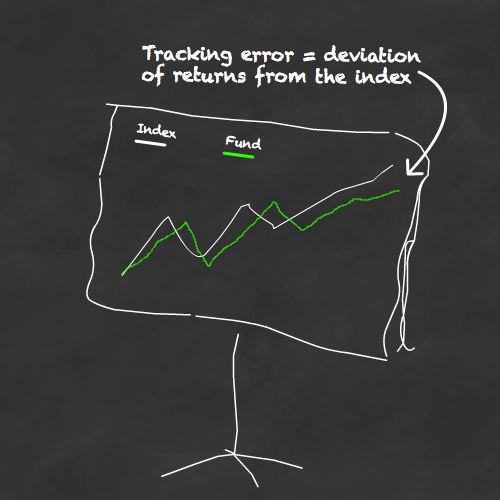 Tracking error = the standard deviation of returns relative to the returns of the index. The lower the tracking error, the more faithfully the fund is matching its index. 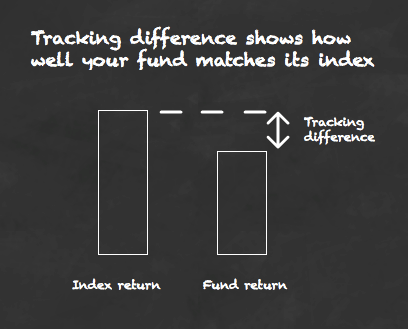 When comparing funds, choose the lowest tracking error possible. A tracking error above 2% indicates the fund is doing a bad job. Index returns aren’t dragged down by operating expenses, but tracker fund returns are. Therefore you’d always expect a fund to lag its benchmark by at least its ongoing charges. The ongoing charges are deducted from the fund’s net asset value (NAV) on a daily basis, so the lower the ongoing charges, the lower the tracking error, and the better the expected fund return, all things being equal. Full replication funds that hold every stock in their index should offer zero tracking error as they are the index. (Except that transactions costs incurred when rebalancing ruin the beautiful dream). Partial replication funds that sample a portion of their benchmark’s securities (because the cost of holding them all is too high) will inevitably generate tracking error, being only a representation of the index rather than a perfect clone. Synthetic funds use swap-based contracts to guarantee they match their indices’ performance. But the swap fees and collateral costs incurred by the contracts drag down fund performance against the benchmark. Taxes and transaction costs like brokerage fees and trading spreads add to our tracking error woes, no matter which replication model is used. The more trades a fund makes, the greater the trading costs, which ultimately undermines performance and adds to tracking error. Although index funds are popularly thought to be so simple that they can be run on a spreadsheet, better management can rein in tracking error. Trustees and IGCs should look for funds with a long record of tight tracking error. Fees earned by lending out fund securities to short-sellers. Dividend enhancement – lending out securities to tax-benign territories when dividends pay out. The extent that these enhancements benefit the investor or the fund manager are determined by the fund manager but should be governed by the IMA. Properly negotiated IMAs will be clean on this , investors should expect 100% of enhancements (without additional undisclosed management fees). Is tracking error good or bad? I found a good chart to answer this question in a Vanguard brochure. What this graph tells me is that Fund A is great in the longer term as it is regularly giving me more return on my money. But in the short term, Fund B is giving me more certainty. Do I want that extra certainty? Well if I’m investing for the short term, yes I do, but generally I’d be convinced by Fund A if I was investing for a long time (which most pension investors do). Tracking error is a good measure to know what you are buying but it doesn’t help you know what you are paying. To do that you, you can use tracking difference as a substitute for tracking error when you want to work out if what you are getting for your money. Tracking difference is relatively easy to calculate. Whatever the IMA says, that tracking difference provides a far more accurate description of the cost of owning that fund. If you are investing using an institutional funds platform (run by a custodian) ,you can be pretty sure what you see as a fund is what you get. If you are running a default on a retail SIPP platform (such as Hargreaves Lansdown or True Potential), you need to check whether your fund is meant to hug the Total Return version, or the Price Return incarnation. Typically trustees aren’t monitoring SIPPs and even IGCs are going to have to warn investors who stray away from the default that they are on their own but they can still be warning investors to be aware that there can be a few different versions of the same index. If you using an insurance funds platform then the funds you are tracking are the insured versions of the underlying tracker. Some insured tracker funds have now been reinsured by your insurer so will be owned by the reinsurer who is responsible for the fund. Some funds started out as ETFs or OEICs, got insured and are now being reinsured. As a general rule , the more complicated the fund structure, the more likely it is there will be tracking difference. Each wrapper invites more cost and the possibility of errors (which are rarely in the interests of investors). Look for short lines of communication and uncomplicated fund structures. So what makes for good? The larger the performance gap between fund and index, the more flawed the product is. Even a tracker that’s trouncing its index is no cause for celebration. Trackers are designed to match the market, not beat it, so deviant performance simply shows the product isn’t to be relied upon over the long-term. Chances are that the funds with the least complicated structures will also be the ones with the lowest tracking difference. But unless Trustees and IGCs understand the terms of the IMA, they will have no way of gauging the money their members are really paying for their fund. Once they know their IMA is offering VFM, they need to make sure that the fund managers manage within the agreement, don’t have tracking error that is either too high or too low and that the tracking difference is within the expectations offered by the IMA. I am not an expert in IMA negotiation, but as a conscientious investor I would like to think those who are my trustees or sit on my IGCs – are! What makes for good is good governance, which starts with the Investment Management Agreement, continues with the monitoring of the tracking error and tracking difference of the fund and ends with good outcomes for individual outcomes for members. How can we influence this to happen? We need to get savvy and start bending the ears of trustees and IGCs. If we are trustees or sit on IGCs , we need to put this stuff into action. We should not shut up, we should be noisy. There is no short cut, it’s our money and we need to kick arse! This has been a long blog and I’m grateful for Monevator from whom I’ve cribbed a lot. This entry was posted in pensions and tagged ETF, governance, IGC, pension, SIPP, Tracking difference, Tracking error, VFM. Bookmark the permalink.